Okay… let me back track for a second and let you all in on a little secret. When Goose and I first started hanging out, I learned that he had just gotten out of a serious relationship with a girl he was apparently "oh so in love" with. 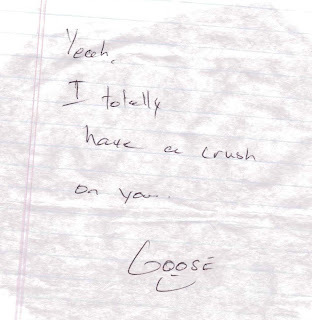 The girl had ended it with him, so enter “heartbroken” Goose. I was the Rebound Girl. I wonder why I never thought about that before (although 5 years of marriage behind us, who cares). Anyway, Goose and I were at the amazing, head-over-heels, making everyone around us sick stage of our relationship (we had been dating about 7 months). He was actually being honest and that freaked. Me. Out. I never pictured my dream wedding, or babies, or the perfect little house. It just was not in my view of the future whatsoever. And that suddenly changed… getting married didn’t seem like such a bad idea. We talked about it a little more and realized we really did want to marry each other… like yesterday. We got “officially” engaged after 8 months of dating...(That might seem irresponsible and I guess it is. You need more time to get to know someone… bladdabladdabladdaaa but okay, from the age of 13 to 20, I did not use logic to make decisions). Since we already knew we were getting married and had looked at a few rings, he didn’t really know how he would be able to “surprise” me with a proposal. So one day he secretly bought a ring and called a friend that I had plans with. This friend was instructed to tell me to meet up at the restaurant where we worked so we could carpool to go shopping. As I got out of my truck to get in with my friend, Goose was bent down behind my explorer on one knee. (again, I don’t think I could ever get rid of this truck). My favorite part of the whole proposal was telling my family about it. We made the big announcement on Christmas Day 03’. BTW- all the couples are happily married now… we had 4 weddings in 2 years... It is now a running joke with all the guys... Goose "started" it... love you guys! !